Hive is a 2 player strategy game of perfect information that shares elements of both tile-based games & board games – much like Chess but without the board. One Queen Bee that can move only one space around the edge of the hive at a time. Two Spiders that can move three spaces around the edge of the hive. Two Beetles that can move one space in any direction including on top of another peice which renders that piece unusable until the Beetle moves. Three Grasshoppers that can jump over one or more pieces in a straight line. Three Ants that can move anywhere around the hive. Hive is a game that is getting a lot of play at Quantum Victoria at the moment as it contains many, varied strategies and games can be played in about 10 minutes. It only takes a game or two to discover that the key to winning is mobility—retaining yours while restricting your opponent’s. Immobilizing your opponents pieces is accomplished in two major, but sometimes subtle ways. 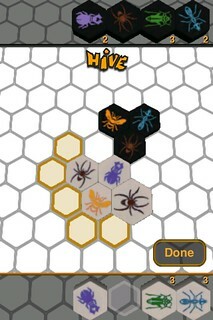 2) Placing your tiles so that your opponents tiles are required to keep the hive intact, rendering them immobile. Some great discussion has taken place around effective strategies, counter strategies, optimal strategies based on your opponents style of play (agressive, defensive, offensive, defensive-aggressive etc. ), advantages/disadvantages of going first/second, strong opening moves, end games, decision trees etc. This opening configuration is essentially unbeatable at the moment given that I don’t make any mistakes. (I’m sure it is beatable, just haven’t been beaten yet!) This opening relies on utilizing the mobility of the ant and the grasshopper as the late arriving pieces used solely for attacking. The spiders and the beetle can be used to pin down your opponents peices but also form a defensive ring around your Queen giving you flexibility depending upon your opponents early moves. The Beetle in particular can be used to escape midgame ‘bunching’ to counter an opponents over agressive Beetle and can also be used as the basis of a midgame counterattack. Highly Recommended & strangely addictive. Play the online version here. After having a discussion with a colleague about the illusion of choice versus actual choice in games, he directed me to a haunting flash game named One Chance that takes 5 minutes to play through and is best played with a set of headphones. 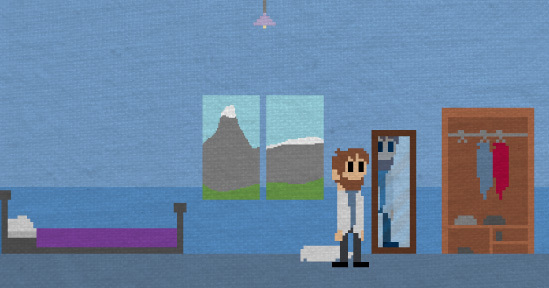 One Chance was developed by AwkwardSilenceGames. As the name suggests, it’s a game that you can only play once (however, by deleting your cookies & browsing history you can reply the game and I highly recommend it) and your choices have very real consequences. One can only describe it as an amazing experience. I established a pretty strong emotional connection with this game and this is one of the main reasons I play games at the moment – this has evolved along side the evolution of games in general. I think this is true for any gamer who continues to play – you want to have an emotional investment with the narrative. A basic synopsis of One Chance: You and your team have found a cure for cancer. Unfortunately, in six days, the world will end. What do you do?